Seated, in the fez, is Nishan Abkarian, who is in his forties. He attended church every morning before going to work at his "general store" in Sivas. Standing, his wife, Makruhe, who is much younger, and possibly a second wife. In the middle, their daughter Anahid. It is unclear if the old woman was Nishan or Makruhe's mother. The studious-looking boy, center, is my maternal grandfather, Agop (Jacob) Abkarian b.1898 d. 1975. He attended the French Jesuit school in Sivas and had plans to attend medical school in France. Jacob's story is that they received advance warning that they were to be seized by the Turks. He helped his father carry bags of gold to the church for safekeeping. On the return trip home they were met on the road by Turkish soldiers and Nishan was beheaded right in front of him. He was left to bury him. He never mentioned which church they attended or if they lived in town or out of town. There was never any mention of their being Catholics, so it is possible that he just happened to attend the Jesuit school. The female relatives were evacuated and forced to march to Syria. He followed them on a parallel route, entering their camp whenever he was able to do so undetected. His grandmother grew tired and couldn't continue and was left behind on the road. He was told that all those lingering behind were subsequently shot. His mother also perished en route. His sister, Anahid, survived, but he was forced to place her in an orphanage where she contracted cholera and died. He claimed to have worked as an interpreter for the Germans in Turkey. He spoke fluent French, Armenian, Turkish and Arabic. He credited his knowledge of foreign languages for saving his life. He spoke a little German and then later learned English. We have no surviving documentation of his employment for the German Army. We do have documentation of his service in Company 13 of the Legion Armenienne in Port Said from 1918-1919. We also have documentation of his service as an interpreter in Adana (Armee du Levant) from 1920-1921. It was during his employment as an interpreter that he left his young wife in Adana and traveled for two months, encountering T.E. Lawrence and saw a train purportedly blown up by him. He met his wife, Eliz (Alice)Vartanian b.1904 from Aintab, when he went to an Armenian refugee camp in Port Said and inquired about arranging a marriage. In a borrowed dress, Eliz served him coffee and sweets in a tent. She was advised to avoid eye contact with Jacob. He was "parading" in front of her tent and she peaked through a hole and saw a handsome man and decided it was okay. He was impressed by her reddish-blonde hair (which later darkened). She was impressed by his uniform and white horse. Thus, they were married by a priest, never having spoken a word to eachother. She was 15 years old. She spoke only Turkish and Arabic and he had to teach her Armenian. There was a witness to their marriage, who ended up in Canada and visited them in the 1940's at their home/farm in Orange County, NY. They lived on a military base of sorts in Adana and Eliz went into labor with her first-born, my mother Makruhe, while strolling in a pomengranate orchard. Makruhe was born 10/24/20. After honorable discharge from Armee du Levant, Jacob worked as a clerk in a watch repair shop in Port Said, The owner had to leave and left Jacob in charge of the shop, which prospered while he was away. He offered Jacob a partnership in the business, but he and Eliz left for Smyrna. They considered Smyrna the nicest place they had ever been: great figs, big watermelons. Jacob's uncle, named Vartabedian, left Sivas approx. 1911 and owned an antique oriental rug business in Brooklyn. He paid for their passage aboard the Belvedere. They slept on mats on the floor in steerage. My mother was a fat, healthy nine- month old infant and was much admired by the passengers in 2nd Class above them. They would take the baby up on deck for fresh air and to watch the wake. Eliz said everyone was cheering and crying at the first sight of the Statue of Liberty. They were processed at Ellis Island. Jacob had a fever and was afraid he would be rejected if he was noticed shaking, so he placed the baby on his lap and pretended to be bouncing her. Upon arriving in NYC, Jacob worked for a year to repay his uncle. He then had a hot dog cart. He then started his own oriental rug/upholstery business on Madison Ave. at 103rd St. Every time his income increased they moved to a better apartment: a brownstone on Lexington Ave/corner of 89th St., 87th St. between Lexington Ave. & Park Ave., Lexington Ave. and 88th St., West Farms Road in the Bronx, Washington Heights near GW Bridge, 74th and Third Ave.,then 69th St. near 2nd Avenue. He was forced to lay off all of his workers during the Depression, including the talented German man who taught him furniture repair/refinishing. The family had expanded to include a daughter, Hyganoosh and a son, still living, Nishan. 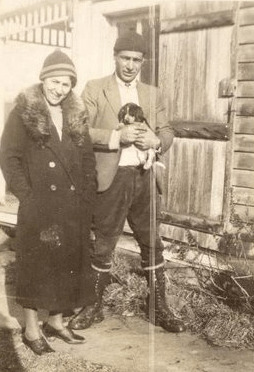 They bought a farm in Howells, Orange County, NY, where they continued their business and eventually retired, spending the winters in Florida with their daughter, Hyganoosh (Agnes)." 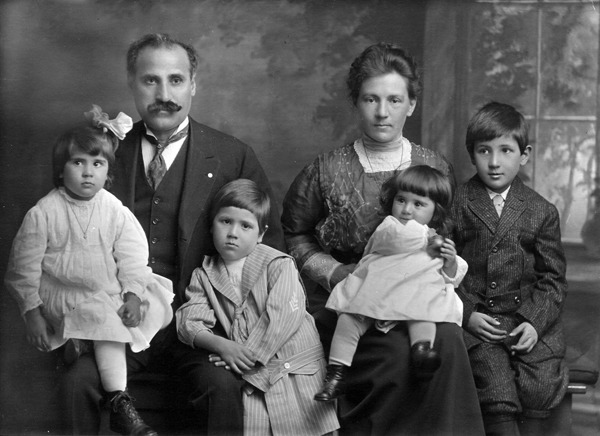 Immigration of Jacob Abkarian June 10, 1921: On the Belvedere under A"p"karian, Agop age 23, Eliss, age 17, Macrouhie, baby, relative in Europe, brother-in-law, Kirkor Tomassian, to Joseph Vartabedian, 246 Pacific, Brooklyn, all listed as born in Sivas. Jacob Abkarian, 114 E 88th Street, rug repairer, born 5, June 1898, in Sivas, Turkey, emigrated from Patras Greece, on or about 28 May 1921, arrived in US 13 June 1921, on the vessel Belvedere, wife, Alica, children Margaret October 24, 1920, Agnes Aug 27, 1922, Nishan September 28, 1928, witnesses, Garabed Der Sarkisian, grocer, and Sam Solick insurance agent. Middletown - Jacob Abkarian, 78, of Carboy Road, died Thursday in Ormond Beach, Fla. The son of Nishan and Makruhy Abkarian he was born April 5, 1898 in Sivas, Turkey. He was a lieutenant in the Armenian Corps of the French Foreign Legion and served as an interpreter during World War I.
Mr. Abkarian is survived by his widow, the former Alice Vartanian; two daughters, Margaret Alexanian of Middletown, and Agnes Abkarian of Ormond Beach, Fla.; a son, Nishan Abkarian of New Hampton; seven grandchildren and three great grandchildren." 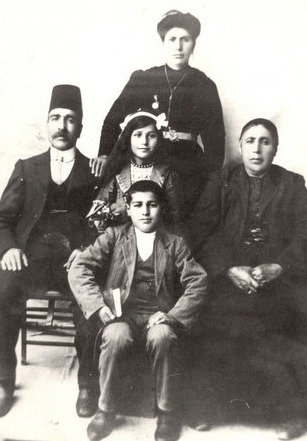 Sarkis, Nishan, and Vahan Abkarian were related to one another in some way. Sarkis was a witness to the naturalization of Nishan. Nishan and Vahan immigrated together. In May 2011 Gene Abkarian wrote that Sarkis and Varhan were brothers. Immigration: September 25, 1883 City of Rome, per passport application. Did not find the City of Rome Sept 25, 1883. Naturalization: According to his Naturalization index card he was a physician. Graduation from Medical School: NYU Medical School class of 1889. 1900: 31st Street, Manhattan, information pretty much the same as the 1920 and 1930 censuses except: no Victor (where was he?) and a daughter named Rita born in 1892. 1920 Census: West 119 Street Manhattan, listed by Ancestry under Larkis, information pretty much the same as the 1930 census except: A son Victor age 26, born in Illinois, civil engineer, a daughter Matilda age 22, clerk bank, Dagmar (the sister in law) last name given as Neilsen. Dr. Sarkis H. Abkarian of 142 Second Avenue, Pelham, N. Y. died yesterday in New Rochelle (N.Y.) Hospital after and illness of two weeks. His age was 85. Dr. Abkarian was a former president of the Greather New York Armenian-American Democratic Association and the Armenia Press Bureau. He had been chairman of the executive committee of the Armenian Church here and of the Armenian Immigration Society. Born in Armenian, he came to they United States when a young man and received a degree from the New York University Medical School in 1889. He practiced here and in Pelham, before his retirement about ten years ago. For many years Dr. Abkarian had been with the Board of Health here. Surviving are a son, Albert, L of Mexico City; three daughters, Miss Dagmar Abkarian, Mrs. Albion C Ockenden of Southampton, Mass., and Mrs. Henry Young Smith of Columbia, Pa.; a brother, V. H. Abkarian of Lockport, N. Y.; seven grandchildren and a great grandchild. New York Times June 25, 1948. Marriage: Esther K Abkarian, Lockport N. Y. age 22, born December 21, 1911, stenographer, born Rochester, N. Y. father, Vahan H Abkarian, born Armenia, mother, Ruth March bron Rochester, N. Y. to J. Donald Craine, born July 21, 1910, son of John O Craine and Ruth Smith. "My grandfather, Vahan, lived in Rochester, New York until about the late 20s, having been decimated by the stock market crash. The family then moved to Lockport, NY where the whole family remained. He had married Ruth Marsh in 1905 and they had four children; Vahan Marsh (my father), Esther, Stephen (who died at about 7 years of age), and Ruth." 1917: Copyright, ABKARIAN (Ruth E. M.) * Rochester, N. Y. Stephen Francis Abkarian. 2 p. l., 9-58, 1916, English, Book, Illustrated edition: Stephen Francis Abkarian, March 29, 1910-August 12, 1915 ... Abkarian, Ruth E. M.
NURSE. - Trained; attendant to invalid gentleman; long hospital and private experince. NISHAN ABKARIAN, care of Dr. Abkarian, 167 Glenmore ave. Brooklyn. Tel. 568L East New - York." 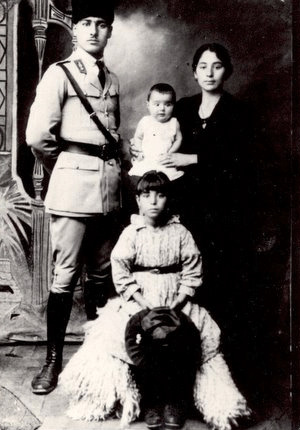 Vahan and Ruth Abkarian with their children circa 1916. Vahan born 1908 is on the right.